Black Rock State Park Campground offers 96 campsites for tents, trailers and RVs in a wooded setting, within walking distance of the beach and swimming pond. Cabins are also available for rent. Each campsite has a fire ring and a picnic table. The campground is usually open late May through labor Day in September and has restrooms with flush toilets and hot showers, an RV dump station, a food concession stand and camp store and a picnic area. Firewood and ice are available at the camp office. Our favorite Black Rock campsites are: 48, 49, 73 and 74. Tucked into the scenic rolling hills of the Western Highlands, 439-acre Black Rock State Park offers a variety of outdoor activities. Steep, wooded ledges covered with pine, hemlock and oak provide the setting for Black Rock Pond. 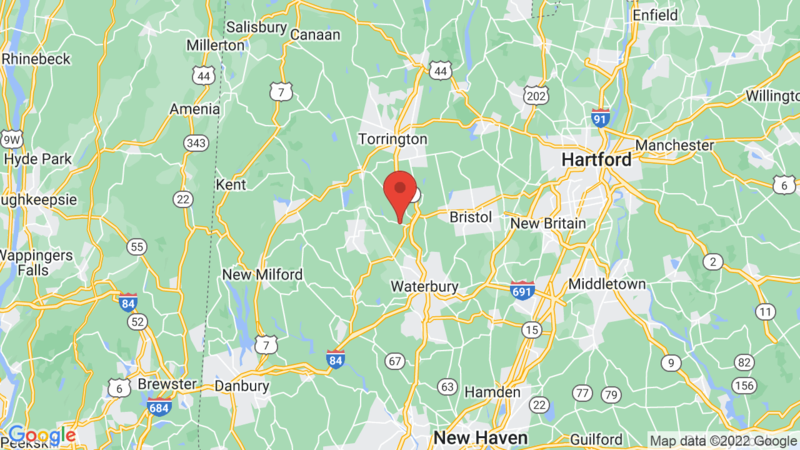 The name “Black Rock” is derived from the local graphite deposits which the early settlers of the Naugatuck Valley were allowed to mine by the resident Indians around 1657. Visitors can enjoy the scenery of the Western Highlands while hiking the blue-blazed Mattatuck Trail, which connects the park to the woodland sections of the Mattatuck State Forest. 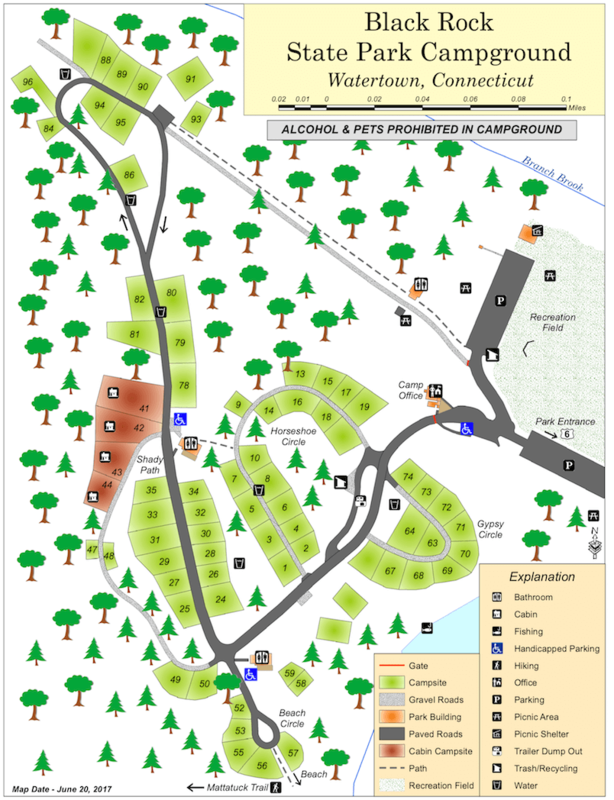 Austin F. Hawes campground is another option in the area. It is about 26 miles to the north, via Highway 8. Visted Black Rock State Park Campground lately? We'd love to hear about your adventure. Did you find us useful? Did we forget something? Anything our community should know before heading out to Black Rock State Park? I have been camping at Black ROck in CT for many years! It is truly a treasure! It is neslted in very scenic areas, close to other wonderful places to visit and explore, close enough for day ventures while comfortably camping with family and friends at this wonderful state park! I have met with and interfaced with the various staff members and rangers and have found them to be very knowledgeable, helpful, kind, dedicated and even funny! I have learned several things from them and witnessed very touching acts of kindness, compassion and sincereity on several camping occassions, how I miss them when the camping season is over! Thank you everyone for such a good camping year once again! Another camping season has begun! Thank goodness! Once again, the campground lifts my spirits and inspires my soul! The bathrooms were cleaned and refreshed last year just before the end of the season and look bright and fresh this year. The staff is at the minimal level since this is not the official full open season, it is a great chance to have this park available to us for the luxury of camping andd early morning fishing since the opening of fishing season. The park isbeautiful now with many trees blooming and small flowers coming out.Black Rock is a wonderful park to visit and enjoy the beauty of the outdoors in! The Ranger and office peopl who have been present have been very, very kind, dedicated and helpful already! It is a pleasure to be back! First i apologize for some of the nasty personal attacks on this campground, park and it’s staff. I have been look at my history, been coming to this park, campground, fishing and hiking place for many many many years and I have seen many improvements and continually watch the stff grow and evolve, watch many sincere efforts by the staff, the rangers, the encon officers at keeping it a fair and enjoyable expieierience, a SAFE place for ALl who come to visit, and protect the environment from our sometimes wild foolish endeavors..we humans are very diversified and often difficult to please and accomodate and I know the people that work there really really try!! Everyone has bad days gets hot, gets tired gets wrong information sometimes and gets deliberately mislead by sneakymanipulative people and parks are NO exception but TRULY I stand UP for the PARK itself it is a priviledge and wonder to enjoy, and The RANGERS are truly trying to do their jobs for the mutual benefit of ALL the safety and well being of all and the safety and well being of the PARK and creatures that inhabit it! If you want free party tme and other activities in public that are not allowed in this state Please go rent a MOTEL! Children do NOT need to be exposed to that!! I stand BY by support and recommendation of this park for mature nature appreciating people! Well, once again this summer has slipped by so fast it is amazing! This past summer’s weather has been starnge BUT I must say, once again The Staff and Rangers, Lifeguards and maintance crew at Black ROck have been working very hard at making it a safe and enjoyable summer for everyone visiting, swimming, camping and picnicking at the park. There were some touchy events and situations I must admit, some heartwrenching but the kindness and dedication of the workers there have helped to work through them. This park is a special place for many,and represents both history, nature and the ability for humans to enjoy both thanks to ALL those who try to be compassionate and caring in doing their jobs! My deepest THANKS to ALL who have helped make it another interesting and enjoyable season!